"Kavi" fans will want to know! It’s easy for some people to kick their exes to the curb when they decide to call it quits. Sure, they may have mutual friends in common or run into each other around the city, but for the most part, it’s easy to not spend any time with them again (even if it’s emotionally painful). It’s an entirely different experience when you have a child with someone. With visits, drop-offs, and parenting decisions to be made, spending time with your ex is inevitable. Kailyn and Javi’s relationship has been rocky ever since they broke up. Sure, there have been times when things seem perfectly peaceful between the two, and there are the other times… where it seems they can’t even be in a room together without fighting. It’s led many fans to wonder if there’s any hope for these two to make it work — as a couple or as co-parents! Now, they’re answering everyone’s questions by openly discussing getting back together. With everything that’s happened between them, would they be able to make it work? No more than a year after their divorce had formally gone through, Javi Marroquin and Kailyn Lowry had both moved on. 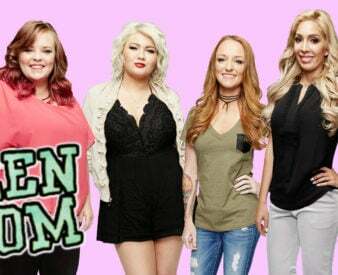 Kailyn got pregnant with another man — her third baby daddy Chris Lopez — while Javi dated a few different girls before ending up with Briana DeJesus, Kailyn’s fellow Teen Mom 2 star. Of course, we all know how that ended. Since then, things seem to have mellowed between Kailyn and Javi. In fact, things were good enough that Kailyn decided to invite Javi to be a guest on her podcast Coffee Convos. They got into the nitty-gritty of everything, including Kailyn’s views on Briana. “Briana isn’t what she portrays on TV. She’s way different. I’m not going to preach about how good of a person she is,” Javi defended his ex, but Kailyn had a different view of things. They also discussed something that wasn’t quite as clear-cut: whether they ever saw themselves getting back together. Kail’s co-host brought up the idea, and Javi explained his side of things. What do you think about Kailyn and Javi’s discussion? Let us know in the comments and SHARE this article!